Since it is now summer and smack dab in the middle of the growing season, I thought I'd give a little summer garden update. I'm quite impressed with myself as I haven't really killed anything yet. 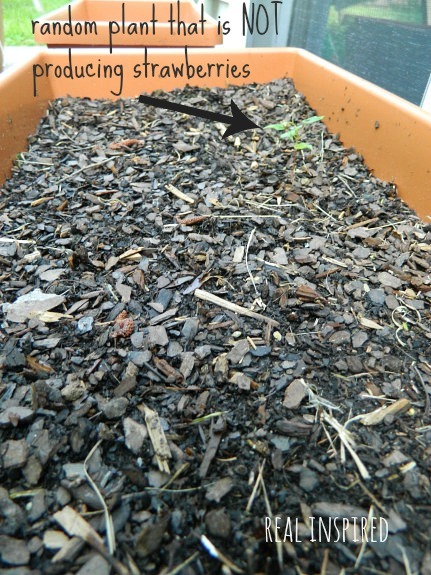 Unless you count the non-growing strawberry plants...not sure what happened there. Probably something that will be really embarrassing and make me feel royally stupid when I find out what I did. And I was so looking forward to strawberries. 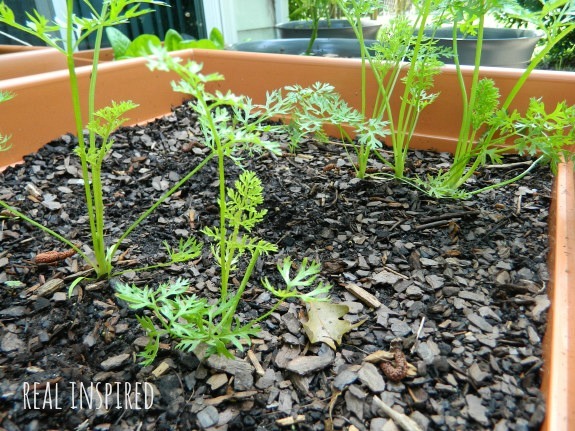 There are a several carrot tops poking up here. I'm not sure what to expect when I pull these babies up. I'm guessing I won't get much as a lot of the seeds didn't sprout. A lot of the lettuce didn't sprout either. I have five things of lettuce. 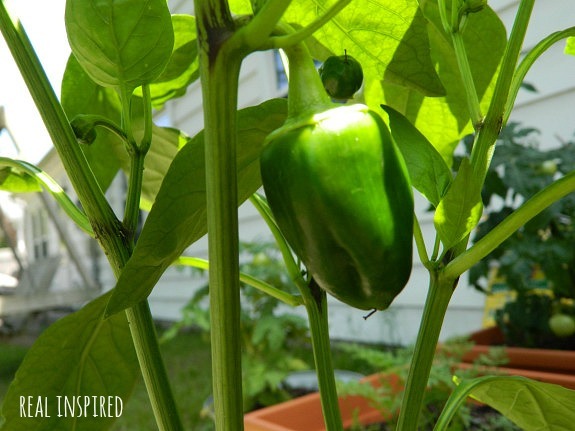 I have two red pepper plants and two green pepper plants. It's been slow and there's been lots of blossoms, but they are finally starting to bring forth their fruit! The tomatoes are my babies. This particular bush tomato plant has over 20 tomatoes on it so far! And it got so big and heavy that I had to rig it so it wasn't laying completely on it's side. The other tomato plant is rather puny but that was our fault for waiting so long to plant it after the first one. Not too bad for a first-timer! I feel quite accomplished. Except for those strawberry plants. Anyone have a guess as to what went wrong there? And I leave you with some random adorableness from helping hubby's family move last weekend. 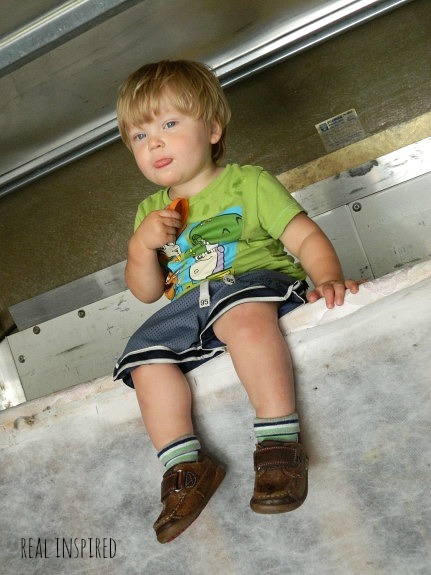 Little Man perched on top of the stuff in the moving truck. It was a long weekend and we are so very glad to be home now! 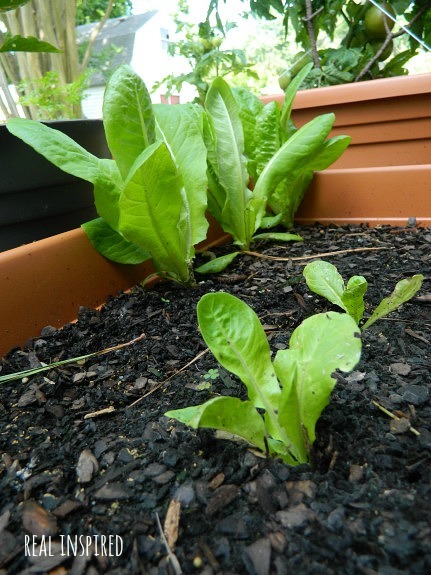 Next year you could try planting your seeds in little containers and then transplanting them! That's what I'm going to do next year! And I'm fairly certain that strawberries are really finicky.... I haven't tried to grow any yet, they are on my list for next year, but I plan to get the 1-2 from my Granddad and my Dad. I figure they might know a thing or 2 about it since they have grown acres of them before! 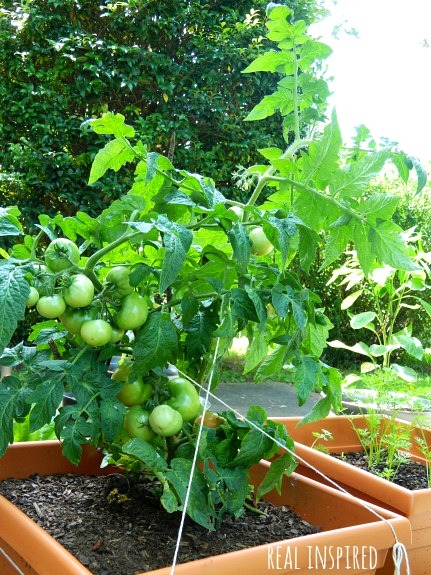 On your little puny tomato plant, try pruning the bottom stems off. It will help the plant focus more energy on growing up, and allow the upper leaves to get more sun light which equals more photosynthesis (sp? ), which equals more energy. You can also get some large sticks (or just get some tomato steaks from your local co op or lowes) and tie your tomato plants up to the stick! It helps with the weight of the tomatoes, and allows the leaves to get more sunlight. You'll have to make several ties per plant though, (otherwise the plant will split in 2, lesson learned the hard way!) and you don't want it too tight, just enough to hold the stems up! I originally used old nylons that I cut into strips :) I'm learning all this right along with you!!! I call my dad at least once a week with questions. You'd think that I would have learned more from living on a vegetable farm, but alas--I know nothing! It's been a lot of fun to far though!